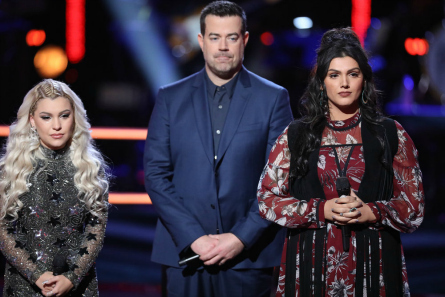 “The Voice” coaches were prepared for another week of Battles equipped with their Mentors helping them to advise their team memebers. Adam had Julia Michaels, Kelly Clarkson brought Hailee Steinfeld, Blake had help from Trace Adkins, and Alicia Keys’ Team adviser was Shawn Mendes. Before the Battles, Alicia said she was going to “gift” all the coaches with “many steals!” Alicia herself has two Steals left to use. The first Battle came from Team Blake. Kaleb adopted an 11-month-old son. The last time that he pursued music was eight years ago. 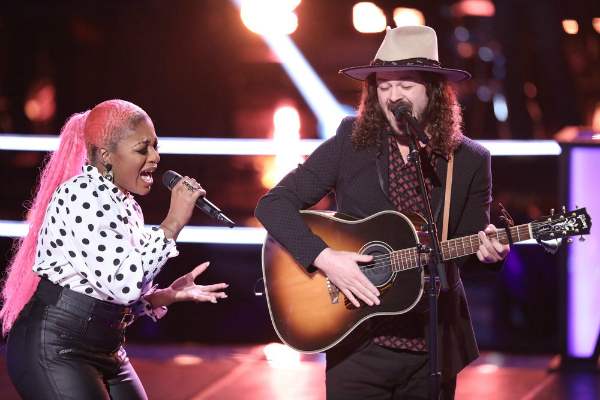 During his Blind Audition, Blake said his voice reminds him of the “Country red dirt country music.” Kaleb was going against 4-chair-turn Pryor. Pryor stated that Kaleb is actually one of his closest friends and they used to be roommates. Kelly called it an “evenly matched Battle” and they both brought their A game. She thinks Pryor did better. Called Kaleb a “dark horse.” Alicia said they “owned it.” But, she chose Kaleb. Adam prefered Pryor. Coach Blake said it sounds like they’re still playing at a bar every single night (it’s a good thing). He said Kaleb stepped-up to the challenge. Pryor won the battle. Battle WINNER: Pryor. Blake said there’s no one else that sounds like Pryor which is why he chose him.. STEAL – Kelly stole Kaleb. Kelly wanted Kaleb since the Blinds. She thinks he has great potential and loves having a Country singer like Kaleb. Said Mia has “a rich tone to her voice” and is soulful. She said it’s intimidateing. Genesis was born in Cuba. Mia said Geneseis is the real deal and her voice is “powerful” it give her chills. They were given “Because of You” by Kelly Clarkson. Adam and Julia advised them to stand-out from each other. Julia noted Mia’s strong bravado. During rehearsal, Adam advised the two women to “losen-up” because they were too nervous and tense. Blake said it was a vocally difficult song, but Mia has better vocals and went with her. Alicia went with Genesis. Kelly said she wrote the song at 16-years-old. She called genesis a “pistol” like Pat benatear. but the song was better suited with Mia. Adam said he loves how “out of control” Genesis is. But, Mia is more technically balanced. Adam chose Mia. 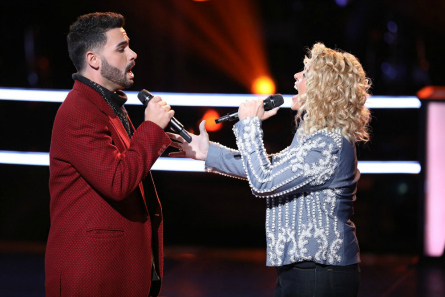 Adam said she has “the vocal chops” that he needs to have on his team. Battle WINNER: Mia. Adam encouraged Genesis at age 19, to NOT stop doing it. Then, Adam questioned Alicia, who has two steals left, why she didn’t steal Genesis. Alicia said she’s looking for a “warmer” voice. Comes from a small Southern town and said it wasn’t easy for her to come-out as gay. Justin said it was also difficult for him to come-out and liked cheerleading in high school. Justin said Kelly breeds confidence and is comfortable in her own skin and can learn from that. Both Molly and Justin are both in the Country genre. “Justin has a soulful R&B thing too” said Kelly and Molly “has one of the coolest tones” Kelly has ever heard. Justin stated not believing in himself is a problem at this stage in the competition. Kelly encouraged them during rehearsal to “own it” be confident and comfortable in their own skin on stage. Justin looked like he was freaking-out with nerves. Battle WINNER: Justin. Justin was surprised by his win. Justin has a story telling voice and a “sweet falsetto” which is important in Country said Kelly. Blake called it a Grammy-like performance and whatever emotional was happening for them, they put into the peformance. Miya did a good job of puting her own spin on it yet honoring the original commented Blake. Kelly called Miya’s performance “inspiring.” Adam reminded the coaches that he was the ONLY one the turned his chair for Miya. “You all should be ashamed of yourselves,” said Adam. Alicia said the song fit into Drew’s wheelhouse. But, it was “totally Miya’s song.” Coach Adam said “the two of you encapsulate all that I love about music” and said it was both to their wheelhouses. He congratulated them on making it a “special moment”. He the winner is someone that makes him feel like he needs to be connected to them and move on with. That was Drew. Battle WINNER: Drew. Adam said he picked Drew because his voice is contempoary, and modern. But, feels old-school too and thinks Drew will do really well. STEAL – Alicia Keyes stole Miay. Alicia said she’s been waiting! Alicia wants to explore places that would be “unexpected” and doesn’t have anyone like Miya on her team. Alicia said she thinks she can take Miya to a different stratosphere. 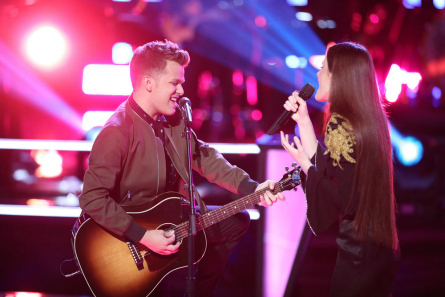 During rehersal Blake suspected that this will be a Battle where another coach will want to steal the losing artist. Kelly LOVED their peformance. She said Wilkes was more “on-point” and low-key. Alicia called their performance “electric.” Alicia said she perfers the “husky and raw” sound tha Wilkes has, and chose him. Adam said Wilkes is one of his favorites, and called Jordan “a fantastic singer.” Coach Blake said he’s glad that he got to watch them rehearse this season which is new. He said Jordan “nailed it.” Wilkes has the same kind of energy, he just uses it in a different way and stated that they both delivered a “perfect performance.” Blake made the decision to keep Wilkes. Blake said he chose Wilkes because he has that “rough around the edges sound that’s hard to come by” and wants to work with him. Battle WINNER: Wilkes. Alicia said she’s saving her steal for a female artist. Adam said he blames Blake entirely that he didn’t get to work with Britton because Blake “blocked” him during the Blinds. But told him that their stage presence, etc.. is “timeless.” Kelly stated that if Jaclyn was up for grabs, she’d steal her. She called her “classic”. Alicia said Britton has such a “lived-in voice” and she’s a “fan of Jaclyn’s voice. She reminds people that there’s a sweetness in the world. Alicia said Britton as a 16-year-old, completely owned who he is. Alicia chose Britton as the winner. Battle WINNER: Britton. Alica said she chose Britton because he has a “special thing” at only 18-years-old, he’s a force to be reckoned with. “Don’t forget Britton,” warned Alicia. STEAL – Blake Shelton stole Jaclyn. Blake said she reminds him of a young Cher. “The work-horse up there.. Jaclyn is freakin’ awesome,” stated Blake. Adam gave Stephanie and Jackie “These Dreams” by Heart. Stephanie said now that she’s in her thirties, she knows herself better now. After their Battle, Blake said there were moments in there that “got very impressive.” But, it wasn’t in any of their wheelhouses. If he had to pick he’d pick Country, Jackie. Kelly chose Stephanie because she sang one of her songs in the Blind Auditions. Kelly thinks that they can nail both Pop or Country. Alicia observed that Stephanie has more of an awareness of herself. Where Jackie has a raw, untapped talent. Coach Adam said they did an amazing job. Jackie didn’t know about harmonizing stated Adam, and she learned. He said by the end, the growth by Jackie was “astounding.” In making his decision on the Battle winner, Adam expressed, “sometimes we gravatate towards someone in ways we can not explain.” He chose Jackie. Adam said “Jackie has no idea how good she is” and she’s going to go really far. Battle WINNER: Jackie. Jackie said Adam gave her confidence that she didn’t know she had. Alicia didn’t Steal Stephanie because she was waiting for someone who “inspires,” she said. Livia said Terrence’s falsetto is “crazy.” Terrance said he’s never had a regular job. He’s traveled the country. But, put his career on hold for his daughter. Alicia said they both have a “throw-back vibe and a tenderness” which is why she paired them together. They sang “Stars.” Mendes said Terrence’s creativity is “through the roof.” Alicia called them powerful and dynamic when she saw Livia and Terrence rehearse. Adam said Livia showed a strength in her voice. Part of Terrence’s magic is that he draws people in, in a quiet way that is really powerful. Coach Alicia chose Terrence as the winner. Alicia said she believes Terrence has something unique that she can help bring out. Spensha hadn’t sang in three years before going onto “The Voice.” Dallas was home-schooled and has posted videos at a young age. At her Blind Audition, Blake called Dallas “our next hero in Country music.” Blake said its a tough song and about it was as “rangey as it gets.” Trace commented that there wasn’t “a lot of timber there” after their first go at it in rehersal. Trace said Spensha was his favorite. Blake’s plan was for one of them to get stolen so he can steal her back. After their Battle, Kelly said she loves that Dallas is just starting. Spensha has an undeniable huge presence and would pick her. Alicia said Spensha has unlimited ability to sing in any style. But, chose Dallas for her unlimited potential. Adam said “the untapped potential” is hard to not want to discover. Spensha has a chameleon aspect that’s hard to do. He also compared Dallas to past ‘Voice winner Daneille Bradbery. Coach Blake reacted to their Battle stating that Dallas stepped-up the plate. Spensha has the ability to blow the minds of Nashville and turn Country on its head. Blake picked Spensha. STEAL – Alicia pushed her button for Dallas right away. Alicia said she sees something really special in her at only 17-years-old. Alicia said Country and Soul is a beautiful mix and they’ll benefit each other.